While having a drink over dinner in a restaurant before heading to a bar or club is seen as a harmless part of socialising in Australia, all too often we go out, catch up with friends, one bottle or drink becomes two. And then three, and before you all know it you’re feeling the effects of a few too many, before you’re even ‘out for the night’. Before you’ve reached the bar, club or next destination, you’re already showing signs of intoxication and perhaps not in the best state to be out and making decisions. Now you’ve probably heard the terms ‘pre-loading’ and ‘pre-fuelling’ and think that’s something that young binge drinkers do at home before heading out, but the same terms can be used for drinking over dinner before moving on. According to the Liquor Stores Association New South Wales, the usage of those terms “fails to distinguish between ‘normal’ social behaviour and excessive consumption.” While that lack of distinction may be true, it leads to an excellent question, are your drinks over dinner normal social behaviour or excessive consumption before heading to the bar or club? Whether a deliberate pre-loading or not, this is where the trouble can begin and not just for patrons. You get intoxicated and start causing trouble you can be hit with a temporary ban of 48 hours, licensees in violation of new liquor laws can receive a two year freeze on new and existing license approvals and/or fines of up to $11,000 and/or imprisonment of up to 12 months, as well as strikes under the Government’s Three Strikes disciplinary scheme for failure to comply with the new laws, and bar staff themselves can have competency cards revoked or disqualified for up to a year for breach of Responsible Service of Alcohol requirements. If you get into a situation where a licensee or member of security has denied you entry to a venue, then you need to respect that decision and move on. At the end of the day, these establishments are businesses and would like you to be able to enter and spend your money, but legally they have a responsibility to ensure you are not a danger to yourself, or anyone else. They want to see you enjoy your time out but also get home safe. When having dinner in a restaurant before heading to a bar or club, take it easy on the alcohol. Consider ordering a drink that ensures you can easily determine how many standard drinks it contains and is not able to be topped up without your knowledge. Keep track of how much you are drinking and ensure you drink lots of water to help dilute the alcohol in your system. If the dinner cheque arrives and you’ve had too much to drink, go home in a taxi or courtesy bus, don’t go onto a bar or club and run the risk of getting into a dangerous situation. 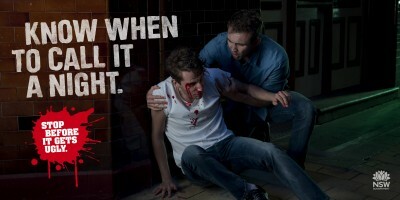 You’ve had enough for one night and we all want to see you get home safely. *The 2013 National Drug Law Enforcement Research Fund study Patron Offending and Intoxication in the Night-Time Entertainment Districts.